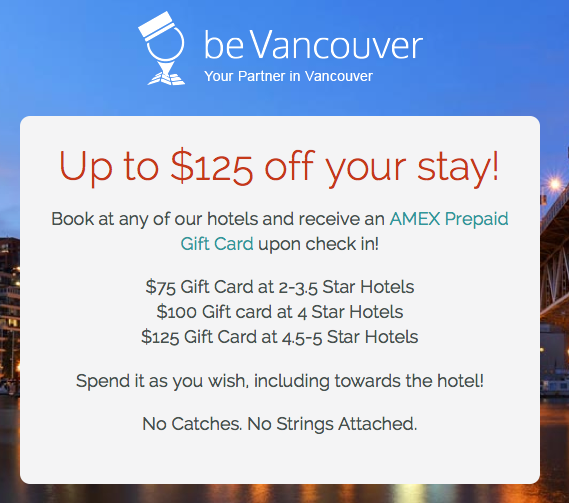 Not too long ago we let you know about an American Express Gift Card offer for staying at select hotels in Vancouver. We are happy to let you know that they have a new offer now running that once again awards American Express Gift Cards for stays in YVR. This time the value of the gift card is based on the class of hotel you stay at. You must book by March 14 for stays until April 30. Click here for full details and online booking. Be aware however that the rates are pre-paid and non-cancellable. Gift cards are awarded as follows.